Cheap hotels, bamboo huts and a backpacker retreat called the Plantation Hostel. The rainy season in Southeast Asia is relentless, but backpacker retreats like the Plantation Hostel in Kampot go out of their way to make sure the rain doesn't stop anyone from enjoying themselves! 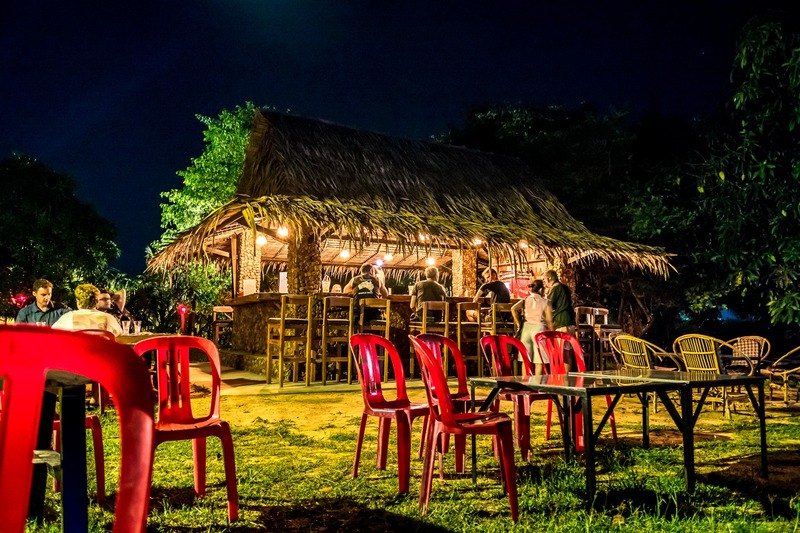 There are plenty of places to stay in Kampot, ranging from inexpensive hostels with very cheap rooms, to exclusive boutique hotels in the heart of town, and even riverside 'beach' resorts. 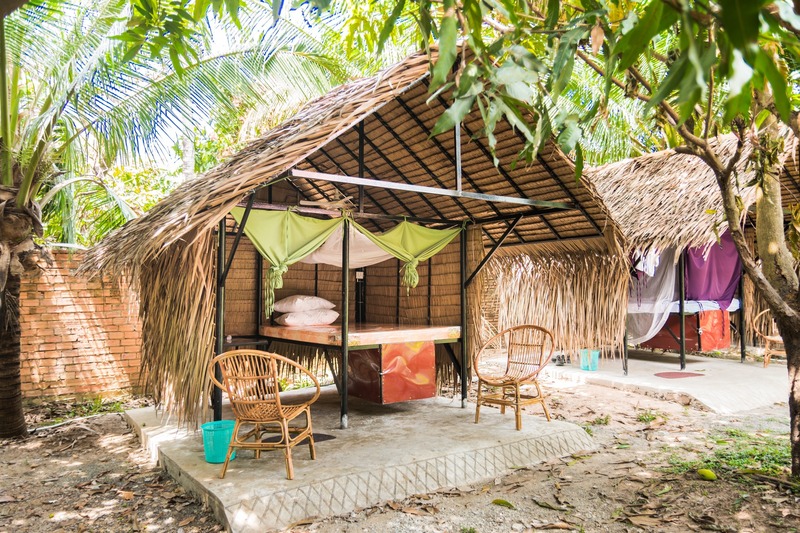 I chose to stay at the Plantation Hostel because it's just 5 minutes from downtown Kampot and surrounded by private fruit plantations that include mango, coconut and passion fruit trees. 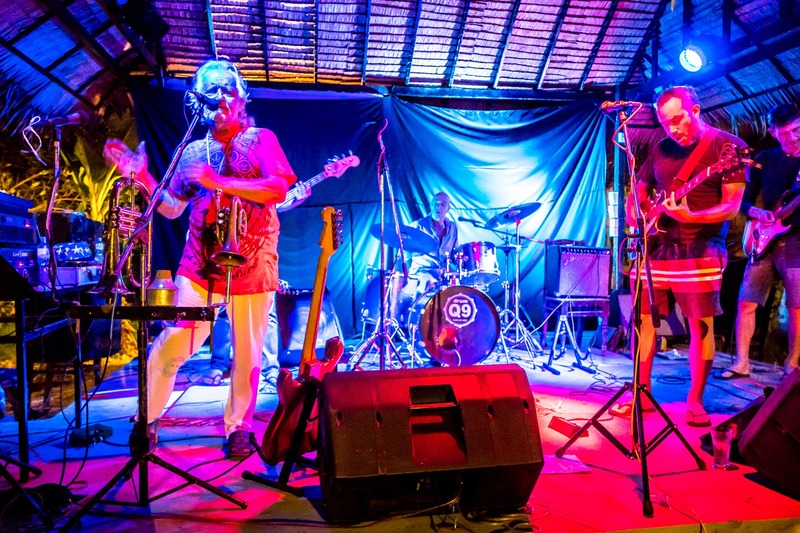 So, What's Kampot All About? 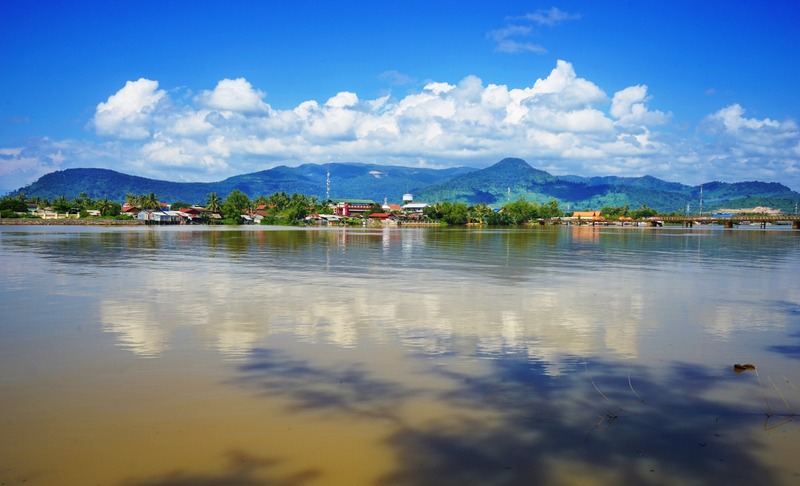 Kampot is a sleepy, colonial riverside town just a few hours outside of Phnom Penh, Cambodia. For anyone making their way from Phnom Penh to Sihanoukville (or vice versa) this sleepy little town is a must-visit. It's an ideal spot for those who want to get off the beaten track - although not completely rural, it is still quaint and tranquil. Oh - and it has some stunning panoramas over Kampot. Kampot made its name in pepper production - it's supposedly the best in the world. The town spreads out either side of the Preaek Tuek Chhu River, just a few kilometers from the Gulf of Thailand. It must have been all-but-undiscovered by tourists until recently - no towering hotels or shopping malls as of yet. It's the first time in months that I've landed myself in a town where the buildings are no more than two stories tall - as you walk across the old bridge, you can see the mist falling below the mountains beyond. It's tranquil and beautiful! Preaek Tuek Chhu River, a few minutes from The Plantation hostel - not a bad view, huh? Anyone who travels Cambodia though will surely lean about the brutal Khmer Rouge regime (from which the famous Killing Fields came to be) and Kampot suffered a lot - it has a long and turbulent history. The plantations here were razed to the ground and the world lost its finest pepper - thankfully the town has bounced back. Jump on a bike here (which you can hire for a couple of bucks a day - tuk-tuks are another option) and ride up to 'Wat Sampov Pram' on Bokor Mountain. You won't be disappointed - it's as good a taste of freedom as you are likely to find. Despite the monsoon mist, the views from the mountains are spectacular, and you'll most likely have the place all to yourself. The Plantation hostel (not to be confused with La Plantation - a pepper farm with a similar name) is a rural retreat, a few minutes ride or ten minute-walk from the center of town. I rocked up (soaked) to meet Clement, the owner of the hostel, who is chilling out at the bar he's built himself - he shows me around The Plantation. A unique way to spend a few nights at The Plantation hostel! I've grabbed a room in the dorm via HostelWorld which is $3 / night - by far the cheapest in town. Since he arrived here, Clement has kitted out the hostel with generous sized dorm beds and the quickest Wi-Fi I've used in Southeast Asia. Dotted around the place are little bamboo huts, not much bigger than the double beds they house, which are perfect for couples. Life is slow but good in both The Plantation hostel and Kampot. Although the rain is torrential at the moment (did I mention that already?) the guys at the hostel are happy to sit at the bar all day and play cards with Clement, his girlfriend Prescillia, and I. Sure, it's off the beaten track but the beer is cold and there are old-school tunes at the bar all day - which I love. Clem built The Plantation's bar himself - he says it's the best in Kampot! The hostel is surrounded by dense Cambodian jungle - mango, banana and coconut trees, frogs bopping around the Plantation's grounds and two of the friendliest dogs you're likely to meet. I'm gutted I couldn't see the Plantation in the sunny season - Clement and Priscilla have been working on the hostel's guest facilities almost a year now and have built an amazing outdoor stage. In high season they hold open mic nights and have local bands come and play - it's a hot contender for the coolest hostel I've stayed in. Clem showed me these pics of live music at the hostel during high season. Wow! The Plantation's dorms and huts are simple bamboo structures - you fall asleep to the tune of thousands of insects on your doorstep and rain pattering on the roof. Don't worry - the mozzie nets will protect you! During the day we chat and chill out whilst I write on my laptop and the dogs try and jump on my lap. I order a bite to eat from the Plantation's kitchen - it's cheap but compared to most, the food at this backpacker retreat is lush. Penning the final sentence of my blog, I tell Clement I want another coffee - and to extend my stay at the hostel for another night. No-one here is in any rush. 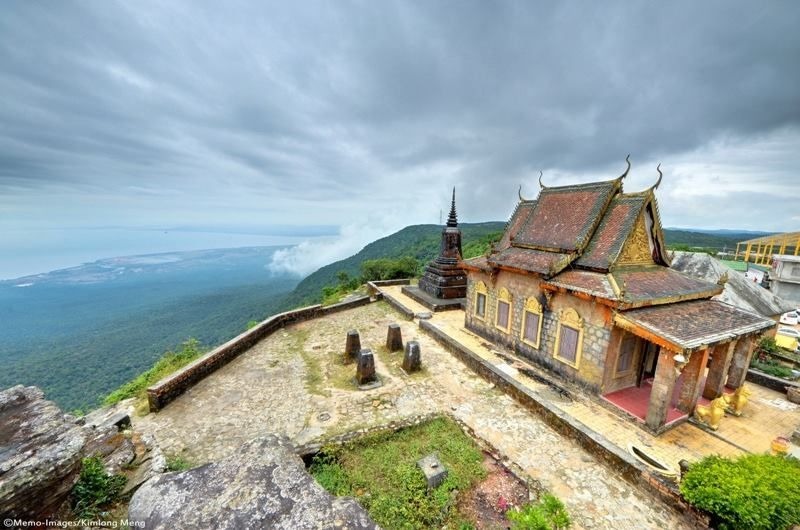 Images: Top of Bokor Mountain - Pinterest; Kampot River - Never Ending Footsteps.